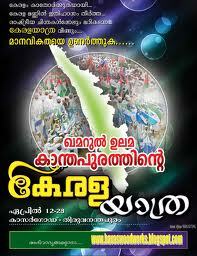 Trivandrum, 27 April 2012: The conclusion of the 15 day long Kerala Yatra led by All India Sunni Jamiyyathul Ulama General Secretary Kanthapuram AP Aboobacker Musaliyar will be held at Trivandrum on tomorrow, 28th April 2012. The concluding ceremony to be held at Chandrasekharan Nair stadium, will see eminent personalities from socio-religious-cultural front. The concluding ceremony will begin with a rally from Putharikandam Maidanam from 3 pm, which will be followed by a valedictory function to be inaugurated by Chief Minister Oommen Chandy at the Stadium. Ministers Aryadan Mohammed, VS Sivakumar, KPCC President Ramesh Chennithala, Trivandrum MP Shashi Tharoor, Trivandrum Major Archbishop Baselios Mar Clemmis, Santhigiri Ashram secretary Gururathnam Gyanathapaswi will attend the function. Traffic regulations and diversions are being made by the City police in connection with the event.